See this post for other details. God is the author of the Bible as well as the author of life. He reveals his heart and his mind through his words. And when you read his words, you get to know him. A Crash Course in the Bible contains approximately two hundred Bible verses. And these Scriptures will teach you what God wants you to know. “God so loved the world that he gave . . . .” That’s the essence of God. He’s a giver. That’s who he is and what he does. He loves us so much that he gave us his only begotten Son. And through him, God gives us everything that we need. He gives us hope and joy and peace. He gives us the desires of our hearts. He gives us eternal life and many other precious gifts. A Crash Course in the Bible describes thirty-eight gifts that God has provided for you. And it tells you how to receive them. Larry Vaughn, author the The Bible Believer’s Handbook, has released another little gem in A Crash Course in the Bible. In this tidy little book, Vaughn plucks lessons from everyday life, from children to faith to recompense to salvation and wisdom, and shows how the Word of God teaches God’s ways to humankind. Opening with an introduction on how times have changed since the Pilgrims first sought America, Vaughn urges us to return to those spiritual roots, and ends with “Twelve things” every believer should know; again, the basics from what faith and redemption are to how to achieve that state of grace and what we should do about it through our newly opened conscience and confidence. 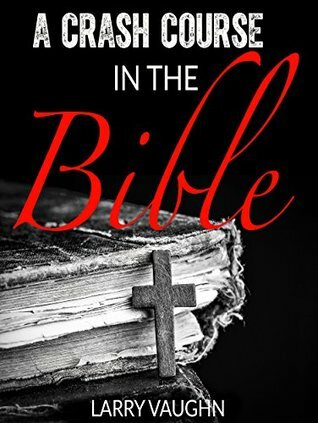 Readers of nonfiction Biblical works will find peace and comfort in these verses, as well as a good way to quantify your faith to share it in a meaningful and understandable way with others. What do you want readers to know about your latest book, Larry? I wanted to make the Bible easy to access and easy to understand. And to show how great God is and how generous he is to us. The readers of my book will know what the Bible says. And they will understand what that means to them.